Miniature opening the prayers to St. Peter, a single leaf from the Chester Beatty Book of Hours, illuminated by the Mazarine Master. This admirable miniature of St. Peter on his throne is characterized by soft modelling, graceful folding of draperies, and fine colours. The illustration of the 'rock on which Christ built his church' shows the most exquisite workmanship that created pure beauty. The key refers to Jesus' statement to Peter in Matthew 16:19, "I will give to thee the keys of the kingdom of heaven." The tiara shows his papal dignity. The meticulous representation of the details in the folds and shadows of Peter’s robe and in highlighting separate leaves of the trees shows this master’s artistic talents. The Mazarine Master was one of the leading figures of Parisian manuscript illumination during the first two decades of the 15th century, along with the Boucicaut Master. Both artists had decisive influence on French illumination during a most resplendent period, and worked for the greatest collectors of their time, among whom the Duke of Berry. The Mazarine Master’s work in the Chester Beatty Hours dates to 1408, as we know from accompanying leaves. This miniature originally illustrated the Suffrage of St. Peter in a Book of Hours once in the famous collection of Sir Alfred Chester Beatty (1875-1968). That manuscript, however, he divided up and preferred to show several single leaves individually. 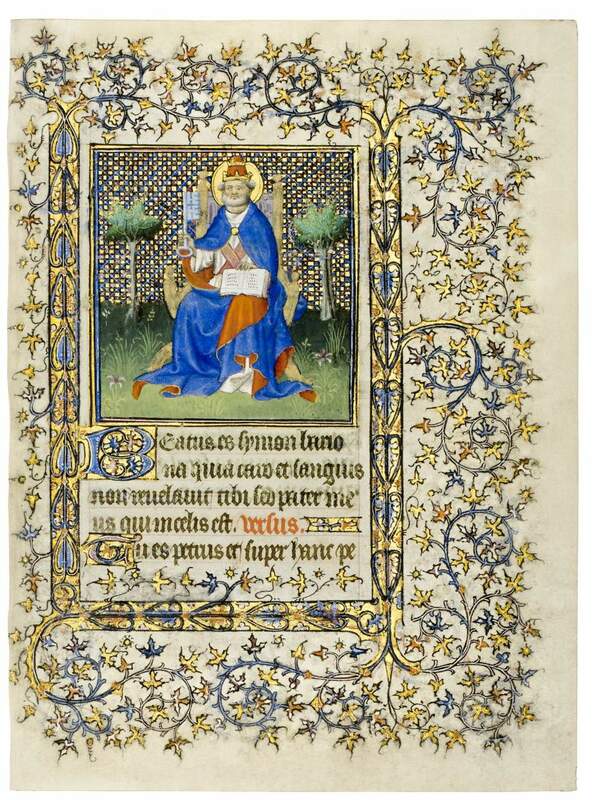 See also this beautiful Book of Hours by the Mazarine Master.